Preheat oven to 325 degrees F. Butter an 8×8 baking dish and line with parchment paper, making sure that the parchment is well pressed in the corners. Set aside. In a food processor, pulse Oreos until they become crumbs. Add in melted butter and pulse until moistened. Press Oreo mixture evenly into the bottom of your baking dish. Bake crust until set, about 12 minutes. Set aside to cool. Clean out the food processor. Add cream cheese, eggs, sugar, ¼ cup heavy cream, and vanilla. Pulse until smooth. Put 2/3 of the cream cheese mixture in a bowl and set aside. Add Nutella and 1 tablespoon of heavy cream to the remaining 1/3 cream cheese mixture in the processor. Pulse until smooth. To assemble, spread the plain cheesecake mixture over the cooled Oreo crust, being careful of the crust. 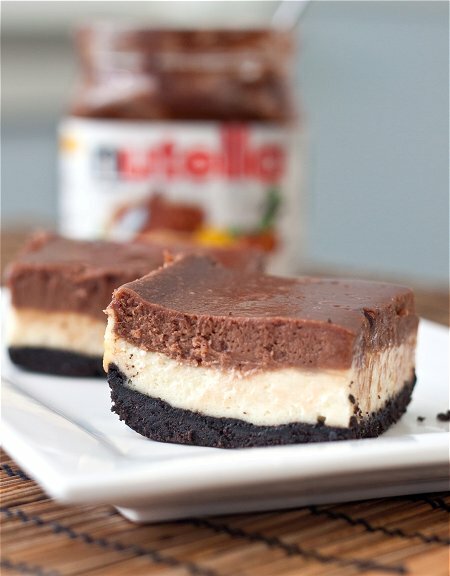 Then pour the Nutella cheesecake layer on top of the plain cheesecake layer and spread evenly. Bake on the center rack of the oven for about 35 minutes, or until the center jiggles slightly. Remove from the oven and cool completely on a cooling rack. Refrigerate for at least 3 hours. When ready to serve, lift the bars out of the pan by lifting up the parchment paper (it should release easily). Cut into 16 squares and serve.